We have been out looking again at the houses Jane Radocchia took us to see earlier this week. 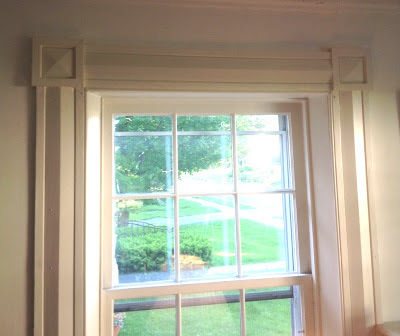 One in particular, in North Bennington, looked certainly to have been built by our Hiram since the trim on the outside of the front door and on the corner pilasters looked so much like ours. As we drove by it again, we noticed that the garage door was open and a woman was inside. Going on the "Nothing Ventured" premise, we stopped and told her of our interest in her house and why we thought it was probably build by "Uncle Hi." She invited us inside and VOILA! The exact trim as in our front room decorated her front room. Our first "discovery". And the discovery became even more interesting when we learned that the owner is a painter, and a good one, who is involved with the plein air event held each year in North Bennington. Pat's ear's perked up at that news. The top photo is of one of our windows. Notice the pyramid in the corners and the beveled pieces surrounding the window. The lower one shows detail of the corner. 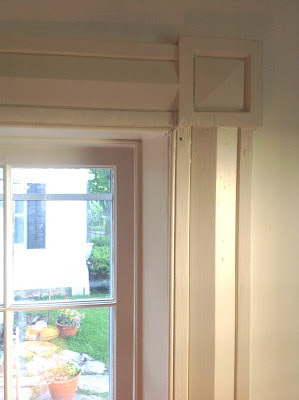 This looks exactly like the molding in the house in North Bennington. Ha! We found the tracks of old Hiram for sure!